Central America (from the Eastern cost of Mexico, down through Guatemala, Belize, Honduras, El Salvador, Nicaragua, Costa Rica and Panama). Spider monkeys inhabit both montane forests and rainforests. Black-handed spider monkeys have long limbs and tail. Their hair is black, brown or reddish and the face is often marked with unpigmented skin around the eyes and muzzle. The arms and feet are darker than the rest of their body. Head and body length ranges from 12 to 25 inches. Their tails are longer than their bodies, with those ranging between 25 and 33 inches. On average, they weigh about 16 pounds (males are slightly larger than females). Their life expectancy is unknown in the wild. In captivity, they can live up to 47 years. Spider monkeys eat mostly fruit. Occasionally, they will also eat leaves, flowers, nuts, seeds, insects, eggs and arachnids. Here at the Zoo, the spider monkeys receive a variety of fruits and vegetables and New World monkey biscuits. There is no regular breeding season or black-handed spider monkeys. Females have an estrous cycle of 24-27 days. Gestation lasts 226-232 (roughly 7 1/2 months) and usually one young is born. Births occur at two to four year intervals. IUCN status – Endangered. Spider monkeys are somewhat tolerant of logging, but they do need large areas of tall forests. Spider monkeys are also hunted for food; their large group numbers and noisy habits make them fairly easy to find. The pet trade is a large factor in many primate species becoming endangered. However, primates do not make good pets for multiple reasons. They pose a risk to health and safety through disease transfer to humans and can cause serious injury by aggressive behavior or strength. Primates are very social animals and need to live with other members of the same species to be emotionally and psychologically healthy. Furthermore, the pet trade is contributing to populations becoming endangered and many are pulled from their mothers at a very early age to be raised by humans. Not supporting primates as pets or primates in entertainment, people can help multiple species thrive. 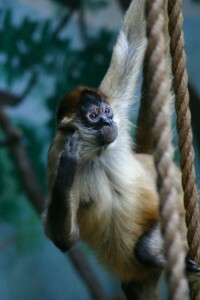 The Zoo’s black-handed spider monkeys are located in the Primate Building. They have two exhibits (one inside and one outside; connected with a tunnel), so be sure to check both places. Spider monkeys have a prehensile tail. Prehensile means “grasping”, so they use their tail as a 5th appendage. The underside of the end of their tail is hairless and has a fleshy pad, which is unique to each monkey (just like a fingerprint is to humans).